You know how you have a favorite president growing up? Like, you get assigned the guy, knowing he’s not one of the big five, but he turns out to be interesting in his own right? Meet mine, James Abram Garfield. I think it was in Mrs. Franti’s third-grade class that we all had to do mini-reports, and I drew James A. Garfield from the hat. I was totally bummed, but it worked out pretty well in the end. He wasn’t Thomas Jefferson, or Ulysses S. Grant, or even Richard Nixon. Who was this guy?! James A. Garfield was a general in the Union Army in the Civil War, hailing from just outside of Cleveland, Ohio. He would, during and after the conclusion of the Civil War, serve as the Congressman from Ohio’s 19th District. On the 36th ballot, in 1880, he became the Republican Nominee for President of the United States. The internecine rivalry between the “Half-Breeds” and the “Stalwarts” lead to a controversial convention. The Half-Breeds, hoping to rid the Government of the patronage system that had developed, were pulling for Senator James Blaine, while the Stalwarts were pushing former President Ulysses S. Grant. Garfield would be the compromise candidate, and his Vice President was Chester A. Arthur, a Stalwart. His Presidency would be the second shortest in American History, as he’d be shot in July of 1881, just four months into his term. His assassin was Charles Guiteau, a mentally-imbalanced lawyer furious over his lack of an appointment by the new president. He was convinced a single speech that he made on behalf of Garfield was enough to get him appointed to an ambassadorship. Garfield, a half-breed Republican, felt no need to continue with the program of patronage, and rebuffed Guiteau. He would try to curry favor with various members of the cabinet, to be run off by Secretary of State Blaine. Guiteau would be convinced that God had told him to shoot Guiteau, and he’d seek out a large caliber gun, a British-made .442, and would stalk Garfield before killing him at the Baltimore and Potomac Rail Station on 6th Street (now the National Gallery of Art). Had President Garfield’s doctors been more proficient, they might’ve found the second bullet near his spine which would kill him. Sadly, it wasn’t to be. Garfield lingered for two months before finally giving in to a heart attack. President Arthur would be sworn in shortly thereafter. 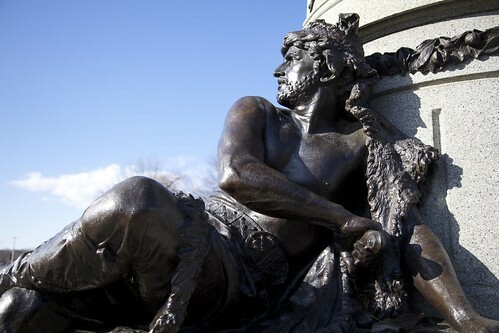 The monument on the southwestern corner of the Capitol Grounds to President Garfield is a bronze statue sculpted by John Quincy Adams Ward and cast by the Bonnard-Hunt company of New York at a cost of $28,000. The money was raised by the Society of the Army of the Cumberland. 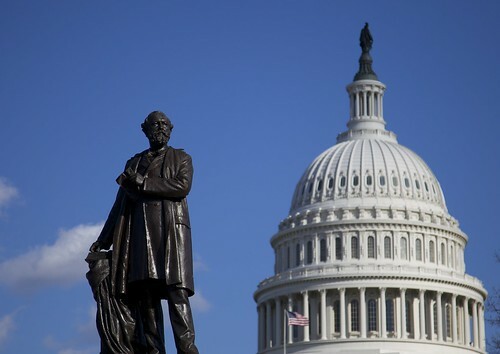 Congress would donate almost $40,000 in taxpayer funds for the pedestal and the three statues that ring the lower level. The statues below represent Garfield as a teacher, his first career, as a soldier, his second, and as a statesman, his third career. The memorial was placed on its current site in 1975.